Know what to expect and demand when having a new kitchen backsplash installed and avoid problems which can be tile related or electrical switches, especially outlets not working properly due to poor installation of the outlets or their cover/plate against the tile. 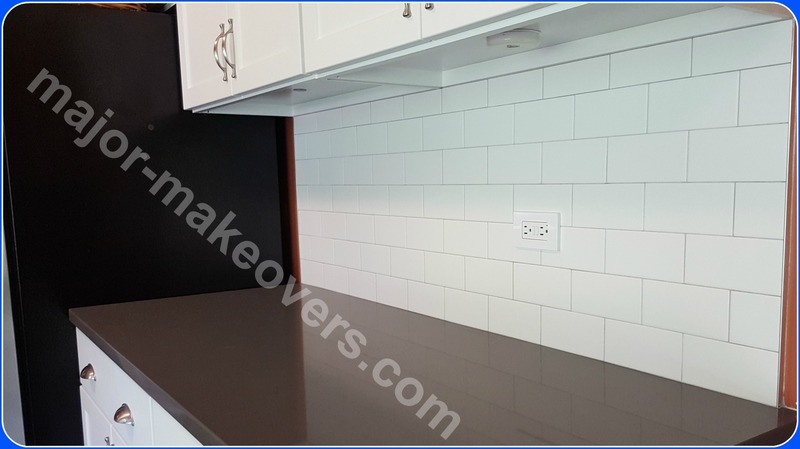 The pictures of one of our recent backsplash projects will give you an idea of what your kitchen will go through and how everything should be done. Here's just one corner of this kitchen. The homeowners have recently replaced their old countertops and you can notice the white paint left behind from the old countertop that ran 4 in. up the wall. 1. If you're getting new countertops, do that before the backsplash tile installation. Counters first, backsplash after. The new backsplash is going to be installed right on top of the countertop. You don't want a new kitchen backsplash installed first, knowing that you want to replace the countertops too. If you're keeping the existing countertops or have just installed new ones, you're now ready for the backsplash tile installation project. 2. Choose your tile installer wisely (experienced, insured, etc.). 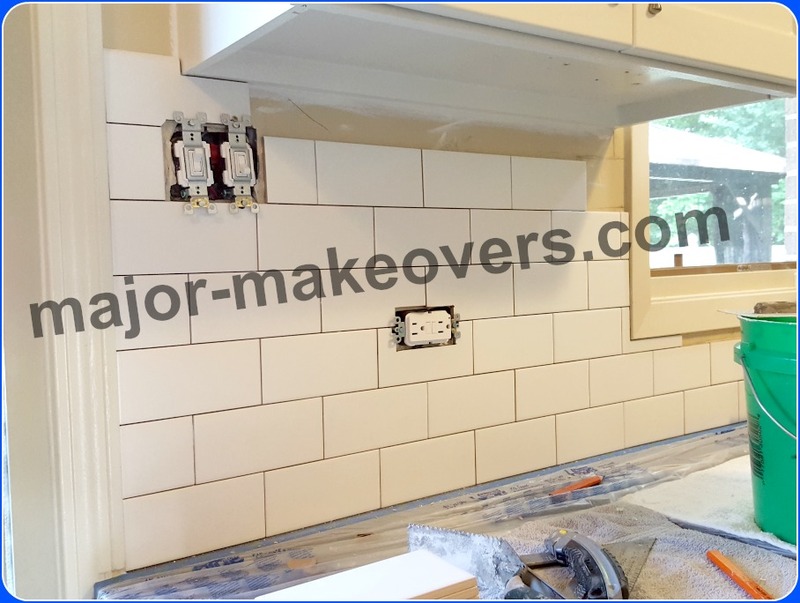 Check his previous tile installation work, make sure he is insured and has enough years of experience to ensure for a high quality kitchen backsplash installation in your home. Always have a detailed contract signed by both parties and never pay in full before satisfactory completion of the tile project. The contract should also include how unforseen work will be dealt with in the event it occurs. 3. Order your tile, bullnose/trim, grout, etc. ahead of time. You can use this 20% contractor discount at The Tile Shop anytime. It may take time for your tile order to come in so the sooner you order, the better. Ask for stain resistant grout (the grout has sealer in it already) so there's no need to seal the grout afterwards. If you are doing a bigger home remodeling project and need more than tile, you can also try the little-known home improvement showrooms called ProSource. 4. Your countertops should be protected during backsplash work. We like to use these 4 ft. wide plastic sheets that overlap the counter and cover half the cabinets too. 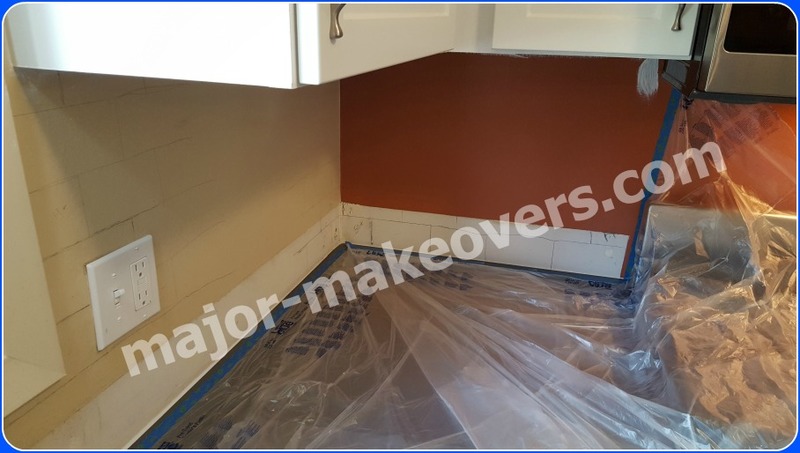 The plastic has painter's tape attached to it and we place the tape on the clean countertop about half an inch away from drywall. The plastic sheets are the first layer of protection of your countertops from any dust or other small debris. The main protection will be towels or drop cloths over the plastic in all areas where tools, tiles or other items will be placed. For now, the faucet will be left exposed to allow room for tile installation behind it but later on, the faucet will be completely covered in plastic sheets and taped to be protected from grout. This homeowner decided not to tile between the stove and microwave (extremely rare occurrence) so the new kitchen backsplash will end right by the stove. That's why we ran the tape up the wall to prevent any debris from falling between the cabinet and stove or behind the stove. The top of the stove is also protected. 5. Decide tile layout, pattern, grout width and other details as they apply to your kitchen backsplash. Your installer should inform you of how level the counters are, how much variation is between measurements in different areas from the countertop to the top cabinets and how these variations, if any, affect the final look of your kitchen backsplash. 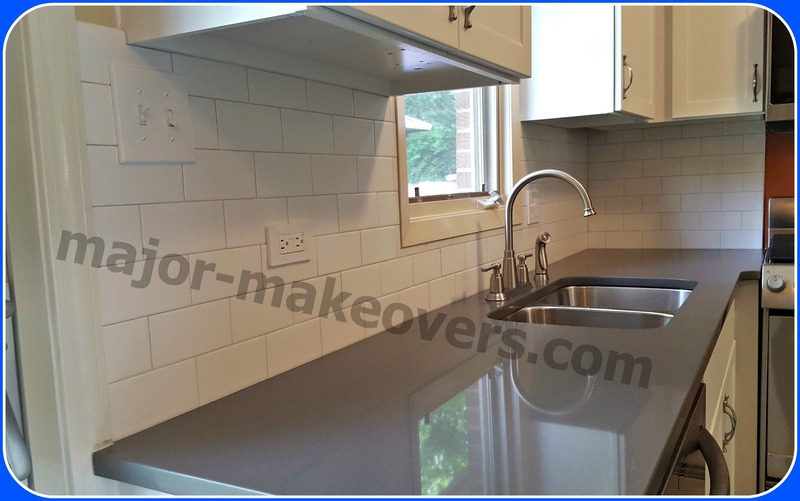 Depending on the tile (or combination of tile) you have purchased, you may need/want to decide some details as they apply to your kitchen backsplash. Examples: how small of a tile piece is going to be right under the cabinets, can we avoid incredibly small tile pieces around obstacles like window frame, etc. For most tile kinds (except small mosaics and other thin strips of glass/stone) we use a pencil to draw in a few places on the wall to see how the finished backsplash will look and what tile sizes/cuts we're going to have and where. This also gives the homeowner a visual and allows to discover if there's a better layout by 'sliding' the current drawing either left/right or up/down. Once the best backsplash tile layout is decided, we're on to the next step. 6. Power is shut off to switches, outlets, etc. 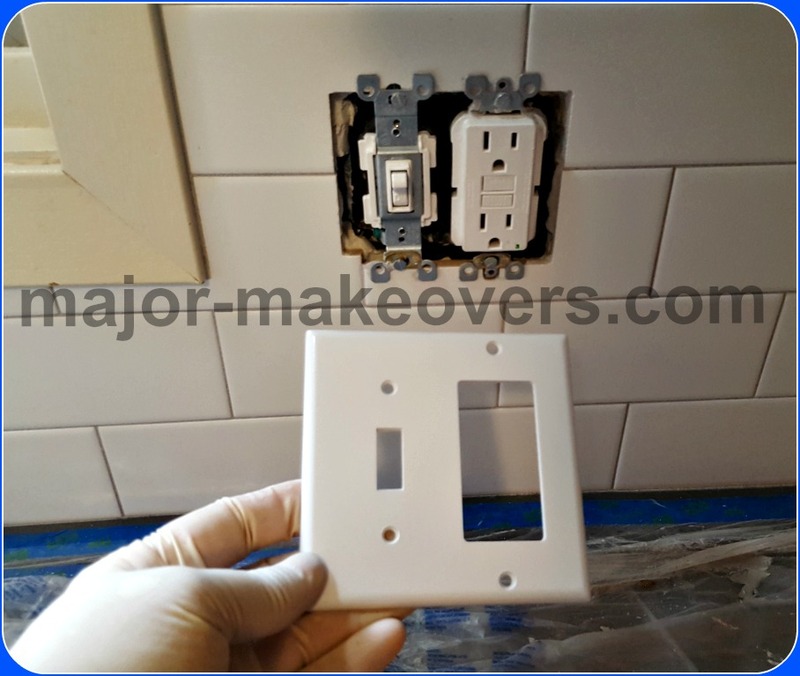 then cover plates are removed to decide if longer bolts are needed for outlets, switches. In a perfect world, there would be a label in your electrical panel that says 'Kitchen Backsplash Outlets/Switches' and it would be easy to just turn that one circuit off. In reality there may not be any labels or something in between. Anyway, consider that when the power is eventually shut-off to the backsplash outlets/switches, the same may have happened to your fridge, microwave, dishwasher, etc. if any of them is on the same circuits as any outlets or switches. This is how a GFCI outlet looks (picture below) after its cover is removed. GFCI stands for Ground Fault Circuit Interrupter and these kinds of outlets are found mostly in kitchens, bathrooms or other wet areas. The fingers are pointing to the 2 tabs/ears of the outlet on the left side. 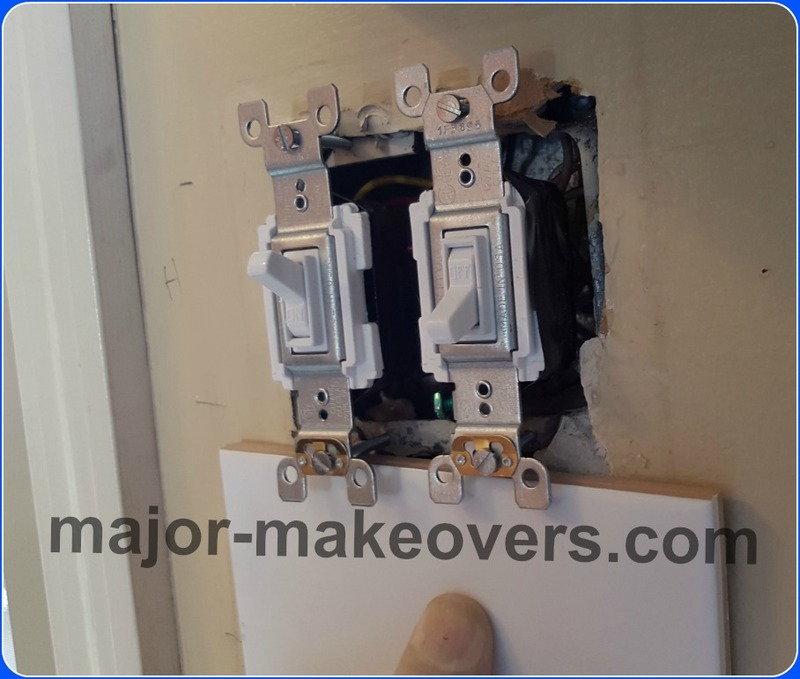 We loosen the screws/bolts on both sides of the outlet and pull the outlet away from the wall enough to check if our backsplash tile can fit between the wall and tabs with extra room left (for now) while the bolts are still connected to the wall. Most of the time the bolts are too short to achieve this so all bolts had to be replaced with longer ones as you can see below. Not only that, but electrical tape had to be wrapped around the outlet to cover exposed electrical wires and bolts connecting the wires to the sides of the outlet. Depending on the last electrician who worked there, the tape may be wrapped around the outlet (good) or there's no tape (not so good). See the areas to be taped around backsplash switches and outlets in this picture. 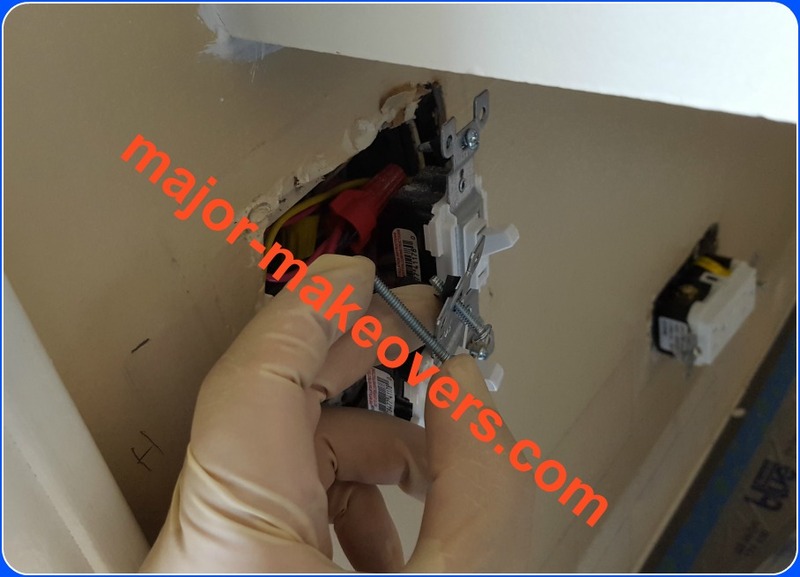 Electrical tape being wrapped around exposed wires and their connecting bolts at the sides of backsplash outlets and switches. When having a new kitchen backsplash installed, chances are the original outlet/switch bolts (screws) need to be replaced with longer bolts to acommodate the tile thickness. You can see below the longer bolts holding the switches in place while the tabs are away from the wall enough so the tile can fit under the tabs/ears plus extra room left for now. Longer bolts allow the tile to fit under the tabs of these switches with extra room left. Very important - Most GFCI outlets have another little tab (red circle below) between the 2 main tabs (green arrows). The tile must go under the main tabs (green arrows). 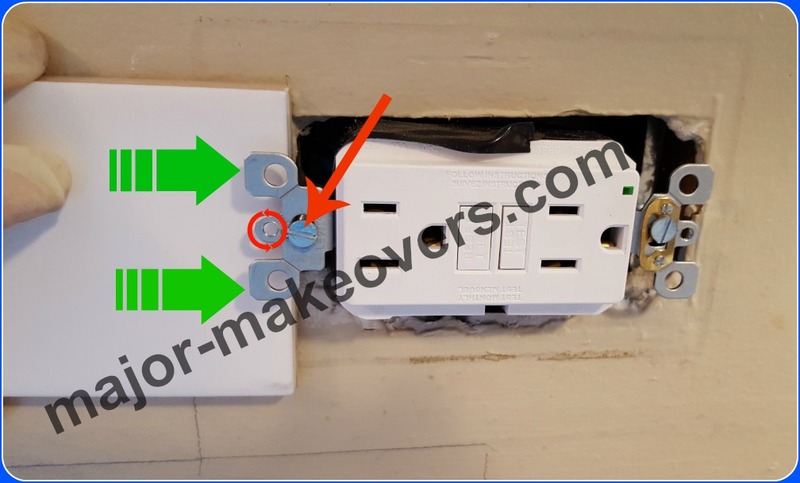 The tile must stop before it hits the outlet bolt (red arrow). The tile must be cut around the little tab (red circle) because later on, a tiny bolt/screw must go through that hole when installing the cover/plate. 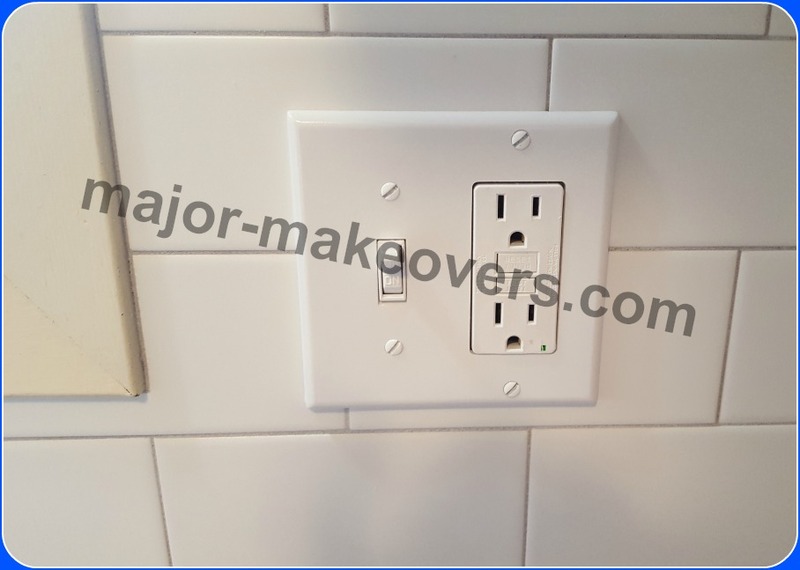 Backsplash tile must go under/behind electrical outlet tabs/ears. And this is how it looks with the backsplash tile installed around a switch or an outlet - in this case both. This view is after tile installation but before grouting. It's very important that the tiles are fully behind the tabs AND the tiles are cut out behind the tiny tabs of the outlet (red circles below) so the cover/plate's tiny bolts can fit there at the end without hitting the tile. Backsplash tile installed behind/under the tabs of outlets/switches and tile is cut out from behind the tiny tabs circled in red, so the cover/plates can be installed later. 7. The backsplash tile installation can begin now. 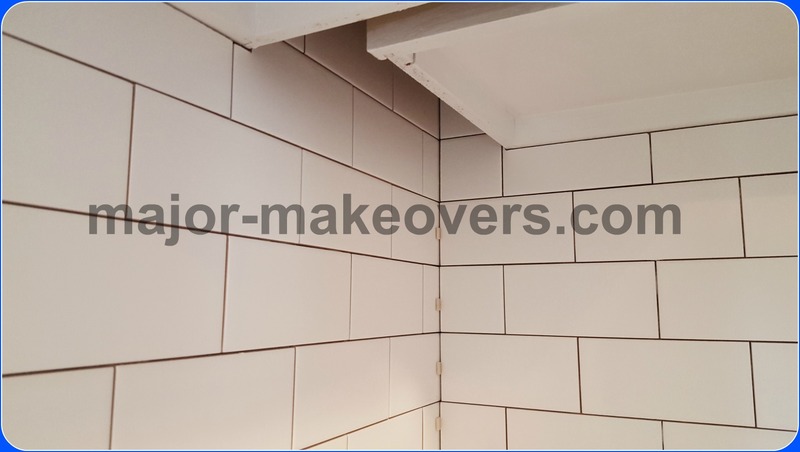 Even though the above picture shows some tile already installed, it was shown only to finish the point started in the other picture above it (with the green arrows). At this point, we usually turn the power back on but this is between you and your tile installer or electrician. As you can see below, the tile installation is well on its way. The tile is 3x6 ceramic and it is installed in what's commonly know as brick style/pattern. The one tile in the upper left corner is a bullnose, meaning it has a finished/rounded edge at the top. All tile rows start at the wooden trim you can see below. The outlets and switches should 'stand' on their own due to the longer bolts installed and the tabs should be a little away from the tile until the adhesive fully dries which usually takes until the next day. A metal edge/trim was used at the end of the kitchen backsplash by the stove to hide the edges of tile. Two more metal trims completed the backsplash on the other kitchen wall not seen yet. The metal trim was chosen by the homeowner to match as closely as possible the stainless steel appliances, cabinet door knobs and drawer handles. Tile spacers are placed at the corner to achieve the same 1/16 wide grout line given everywhere else by the angled edges of each tile. The situation below may or may not apply to your kitchen cabinets but if it does, now is the time to consider what's best to do and have it done accordingly. If your backsplash goes all the way to the end of a wall and continues on the other wall, look under the cabiets and notice if there's any sort of room up there as if the cabinet was too short and didn't get all the way to the wall. It's made like that on purpose to avoid deep, hard to reach areas inside your cabinet. If that's the case, the best way to take care of that is to add extra rows of tile higher up as you see in the picture below. If the last row of tile at the top was not there, you would've seen yellow and brown paint leftovers on those walls. It's true - one needs to either bend over and look there to see that, but it can also be easily seen while sitting down or going up/down the stairs from the kitchen area, if any stairs exist at the right angle to expose this hidden area. Hidden area in the corner under the cabinets where extra rows of tile hide drywall/paint view. When your tile installation is done, it has to dry at least over night depending on what kind of adhesive/thinset was used. Once all areas are dry, the next main step is grouting your kitchen backsplash. 8. Grouting the kitchen backsplash tile. To be on the safe side, it is best to shut off the power again for this procedure. 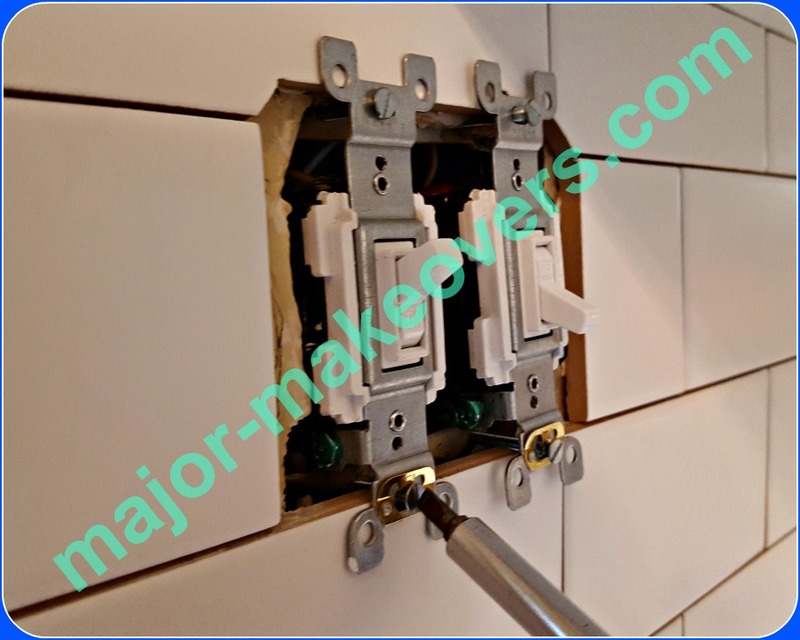 Now that all tiles are dry in place, the new longer bolts of the outlets and switches must be gently tighten in place until the tabs touch the tile. It should be done by hand with a screwdriver and not a drill. Using a screwdriver to gently tighten all bolts by hand until tabs touch the tile. 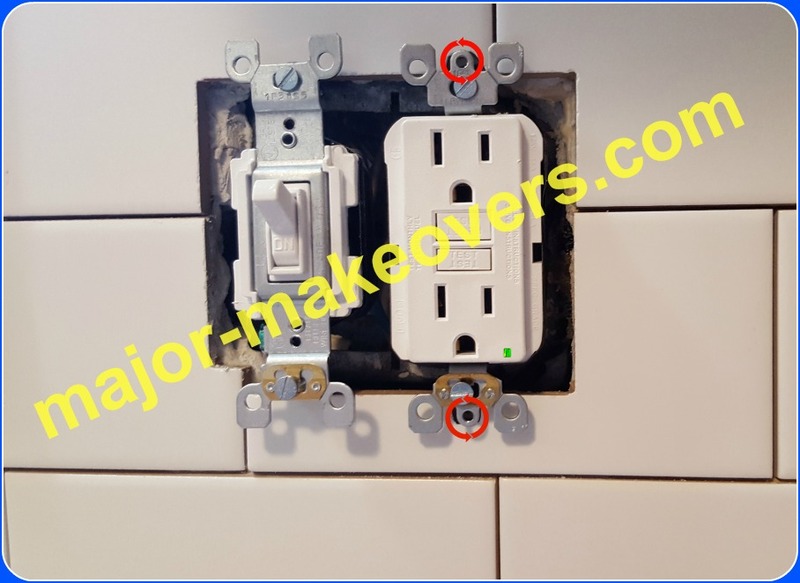 Once all bolts are carefully tighten and switches/outlets' tabs are leaning on the tile surface, they should be covered with tape to prevent grout from getting inside the outlet holes or on/around the actual switches. We usually use duct tape but now we used wide clear tape to keep grout away. And one last thing before grouting the kitchen backsplash - remember the kitchen faucet was exposed earlier? It's time to cover it well with plastic sheets and tape them to the main sheets already on the countertop so no grout can get to the faucet or end up in the sink. Backsplash ready for grout - countertop, faucet, stove protected by taped plastic sheets. Finally, grout is applied to the kitchen backsplash tile. This is quite a messy part of the project but that's why we have the plastic sheets protecting everything and the clear tape over the outlets and switches. 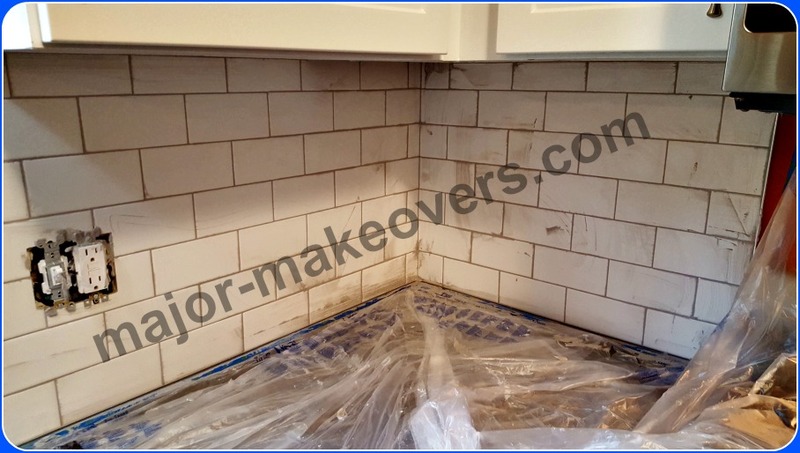 Grout being applied over subway tile backsplash. After grouting is done, the clear tape is removed from outlets/switches and we're ready to install the plastic covers/plates with their tiny bolts. 9. 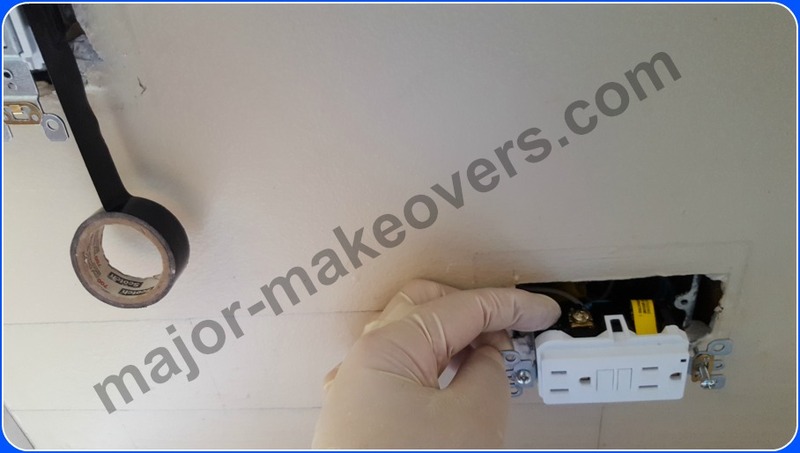 Installation of covers/plates on all electrical switches and outlets. Remember the tiny tab with a hole between the main tabs of the outlet? See the holes (below) in the plastic cover closer to the edges? You got it. The tiny bolts go through there. That's why the tiles had to be cut out from behind those little tabs so there's room for the bolts to go in and not hit the tile. Plastic cover/plate about to be installed over switch and outlet. And here's how the installed cover looks and you can see the heads of those little bolts/screws holding the plastic cover in place. You can also see the 1/16 grout which is Whisper Grey from The Tile Shop. It is stain resistant and never needs to be sealed but you should read the back of the grout box/bag about cleaning and maintenance of your new grout. Save this 20% contractor discount now to have it when you go to The Tile Shop. Plastic cover installed over switch and outlet on new backsplash tile. Once all outlets and switches got their plates installed, it's time for easy cleanup. 10. Cleanup - meaning careful removal of all plastic sheets. Before removing the plastic sheets, we made sure the area by the blue tape was perfectly clean. Then started to peel the tape and plastic away while folding it inward to keep all grout leftovers concealed within the plastic sheets. This revealed the same very clean countertops we covered in the first place. Soon the plastic will be removed from the faucet and the only thing left is to let the grout dry over night before the backsplash/counter area returns to normal use. 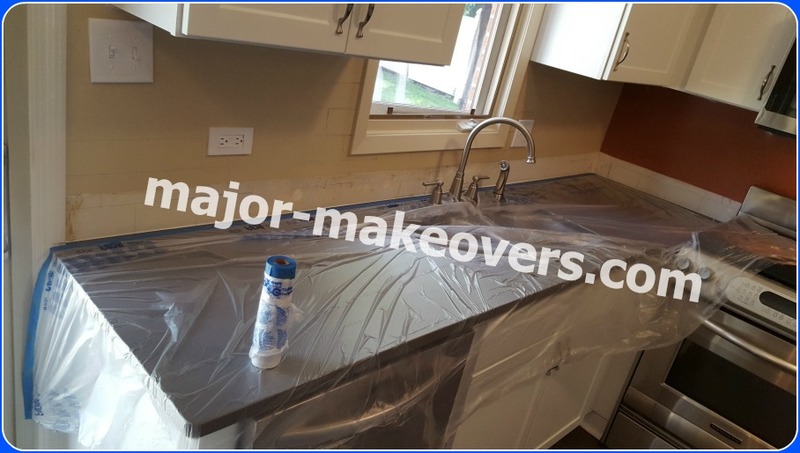 Plastic sheets being removed from countertops after backsplash grouting. Here's the first and only look at the other kitchen backsplash on the opposite wall. The outlet cover you see below, doesn't have any bolt holes because is the kind that snaps over another plastic piece which has those little bolts hidden by the clean-look cover you see. Small backsplash on opposite wall of the same kitchen. Coming back to our main area of this kitchen, we get to see the final look of the completed kitchen backsplash tile installation and clean countertops. Remember, grout must dry over night so it's better not to use the sink or anything that can splash over the wet grout. Placing a towel over the faucet can/will remind you not to use the faucet for now. It's best to keep everyone away from the backsplash until the next day when the grout will be dry. After that, follow cleaning instructions seen on the grout box/bag. New kitchen backsplash - all done. 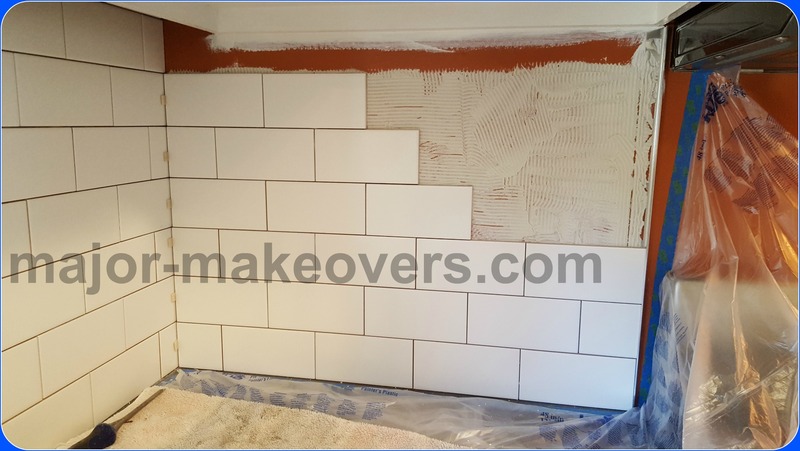 Even though this was only a simple subway tile backsplash, you now know most of the steps involved in having your backsplash done right. Your chosen tile installer may or may not do things in this order and as described here due to their preferences or other reasons like differences from one state to another that affect the process in one way or another. 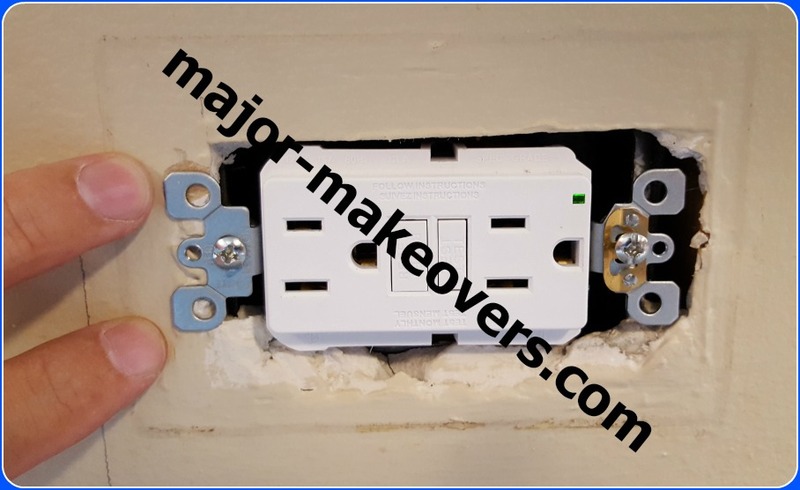 you are able to plug things in your electrical outlets and the outlets stay firm in place, are not loose and don't get pushed inside the wall when you plug in. the tiles were installed per your design/pattern agreement and the grout lines are fairly even without huge differences, especially where tiles were cut. the grout was stain resistant or sealer was applied later per manufacturer's instructions, unless you decided on no sealer for your grout. other - depending on your particular situation. And by the way, any time you need high quality tile, you can use our contractor discount which is 20% OFF at The Tile Shop. You are now ready to get the backsplash you deserve. Good luck!